The brownies turned out so moist and fudgey that it was almost unbelievable. I calculated the calories in them and my eyes pretty much popped out and I had to run the numbers again to make sure I’d done it right. Yes, it was a joyous moment. The Kid even gave these a thumbs up so they passed that test with flying colors. Preheat oven to 350 degrees and spray an 8×8 baking dish with non-stick spray. Mix all the ingredients except the chocolate chips in a bowl until blended. Pour into the prepared dish and sprinkle evenly with the chips on top. Bake at 350 degrees for 25 – 30 minutes. The brownies are done with a toothpick inserted in the center comes out with just a few crumbs on it. I started checking at 22 minutes but mine weren’t done until about 30 minutes. Remove from the oven and cool for 5 – 10 minutes. Cut into 12 pieces. 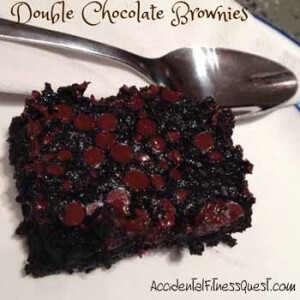 Makes 12 brownies at approximately 91 calories each – 2g protein, 18g carbs and 2g fat. I used one of the 4oz individual cups of unsweetened applesauce for this recipe, but you can use pumpkin, butternut squash, or even mashed banana instead if you prefer. Since I was making these mainly for The Kid, I used C&H sugar stevia blend that is 10 calories per teaspoon. You could also use regular sugar or baking stevia in its place. Your nutritional values will obviously be different than mine above. Regular baking cocoa would work here but your brownies will be less chocolatey. PS – Do you eat your brownies with a spoon, a fork, or with your fingers?